Though the figures from the National Population and Talent Division revealed figures that Singapore's total fertility rate had increased to 1.2 last year from 2010's record low of 1.5, our fertility rate is low behind the replacement level. The 5 countries shown above are facing the same challenge of low fertility rates. 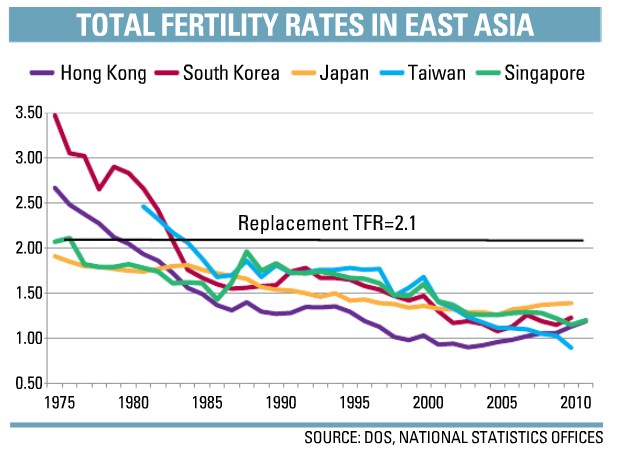 Later marriages, rising single-hood and fewer children are some of the major reasons for the low fertility rates. These could be due to higher level of education attainment and better employment opportunities. 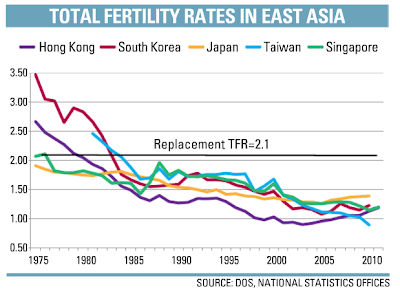 Among the 5 nations, Japan's fertility rate has rose to 1.32 in 2006 and continued to rise. This could be due to Japan's social support system makes it less of a struggle for parents to raise children. Japan also has a national pension system "which takes care of long term social security". To encourage Singaporeans to marry earlier and procreate, housing could be cheaper, education less expensive and stressful and childcare options more affordable. As mentioned by Deputy Prime Minister and Minster for Home Affairs Teo Chee Hean yesterday that creating a supportive envrionment for Singaporeans to form families and raise children has been, and remains, a key government priority in addressing the population challenge. Do you have any suggestions of ways to increase our fertility rate? 0 Response to "Singapore birth rate 3rd lowest in 5 East Asia nations"